Catbeard Goes A-Wenching, Page 2 of 3 – Catbeard the Pirate! So, lots of news. First, let’s address this new character, Cassandra Cutthroat. She was inspired by this magnificent drawing done for me by Caanan Grall, the Eisner-nominated creator behind Max Overacts! Isn’t that incredible? 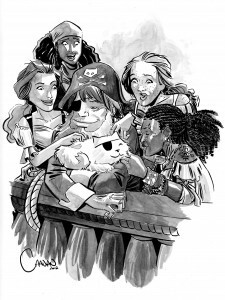 That piece will be in the first Catbeard the Pirate book, which will be coming soon! I have a proof copy ordered, and fingers crossed, I’ll be able to start printing before too long. If you enjoy Catbeard, please consider showing your support by pre-ordering the book when it is available! Speaking of Caanan, he has a really neat idea for an art movement for comic creators called Artonomous. Why not hop on over and read up on it? And yes, he has nice things to say about my silly comic there, as well. Okay, I think that’s everything. You’re all wonderful.